Kretchmar's Bakery is always looking for quality people. If you have an interest in baking or cake decorating or retail feel free to drop by and fill out an application. Current openings are listed below. 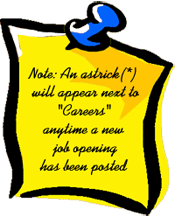 *Note: An (*)astrick will appear next to the careers link any time a new job opening has been posted.